If you missed “Day Two” click HERE. Hop between our Designers to see what they have created with all of our New Products. Each day you will have a chance to win a $10.00 Gift card to My Treasured Kutz store, along with a “FREE” SVG Digital Cut File per day, and a 25% discount code for any purchase at My Treasured Kutz for the month of July. To participate, please visit each of the Designers’ Blogs for inspiration for all the Christmas Products. Comment and show them some love for all there hard work. We will choose One Winner each day to receive the $10.00 Gift Card to My Treasured Kutz store. The winners will be posted Saturday, July 11th on the My Treasured Kutz Blog. So check back and follow the instructions posted there if you are one of the winners. Also, as your hopping between blogs, look for the post with the link for the Daily “Free” Digital File. 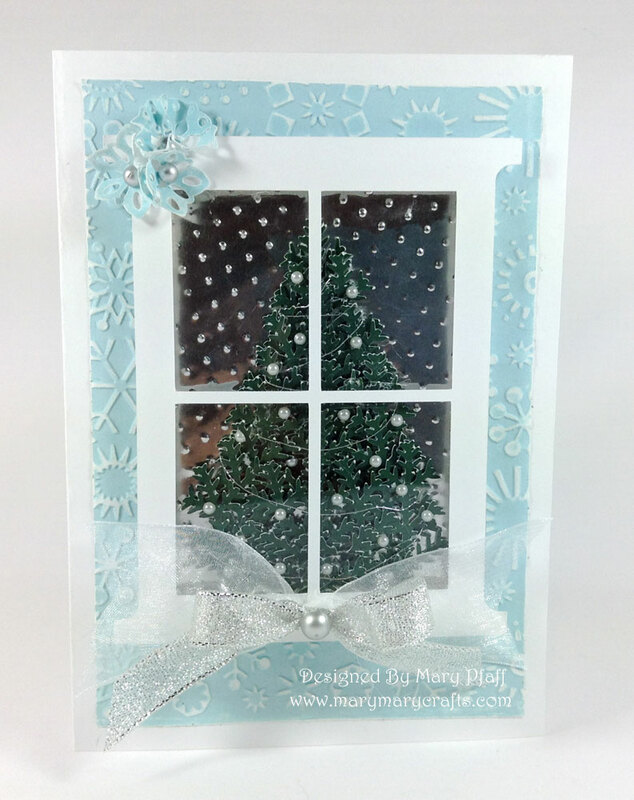 My Window card was used for this design I made. I layered it with white core card stock, embossed with snowflakes, metal foil embossed with Swiss Dots, Evergreen Branch by My Treasured Kutz to create the Christmas Tree, and decorated it with tiny white pearls and silver thread. I used mounting foam to raise the window off the page and placed clear plastic for glass. For the final touch I added My Treasured Kutz Snowflakes to the top corner with pearls. On the bottom I added ribbons and a pearl to finish off this card. To receive your “Free” My Treasured Kutz SVG Digital Cut File” for today. And include in body of the e-mail, your e-mail address. You must do this today, for the file is only free today 7/9/15. We will then send file to you. The 25% Discount Code is WZB19M1509K. Thank you for participating in My Treasured Kutz “Christmas In July Blog Hop" and remember to stop by tomorrow at My Treasured Kutz Blog to see all the New Christmas Releases. WOWzers!! Today another set of gorgeous cards, scraplifting the tree card idea, TFS!! Oh Mary - this card is so soft and beautiful! I love how you made this card dimensional. And the tree looks so realistic. It looks like you used a "topper" as they say in the UK. That windows is gorgeous! The silver balls were super cute as well. Great card! This window card is gorgeous! Thanks for sharing such a beautiful creation!